Finding wall decor for the kids’ room was more of a challenge than I thought. I knew that I wanted an inspirational quote wall art. But deciding what the sign would say was the hard part. 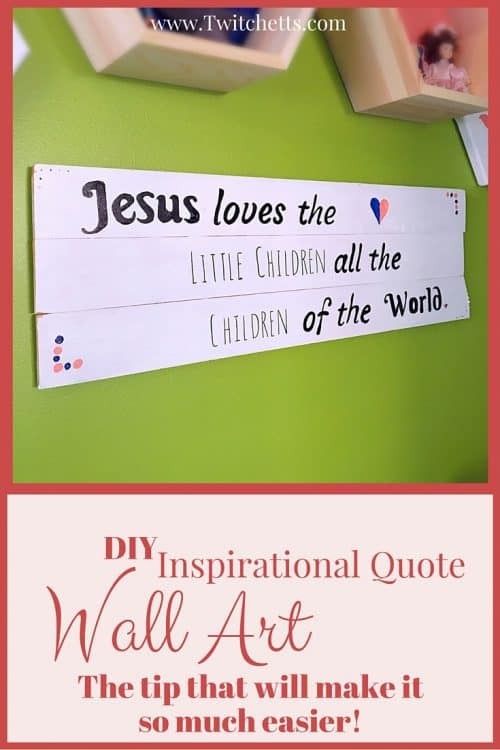 I searched all over Google, Pinterest, and Etsy for ideas for inspirational quote wall art for the kids’ room. Nothing felt right. Either it was too cheesy. Done a million times. 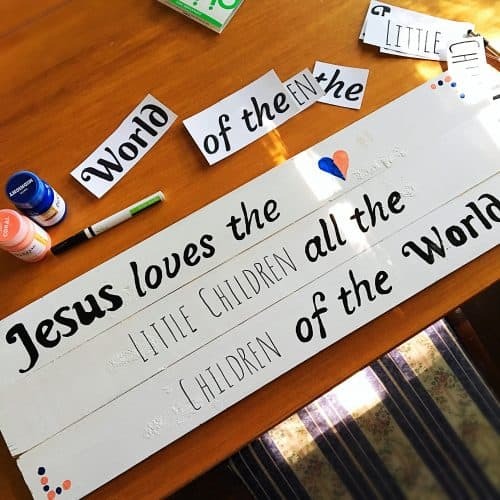 Too long (cause I’m making this sign by hand…I didn’t want it to take forever to create) Finally, we were having a fun song session and we started singing “Jesus Loves the Little Children”. Perfect! This isn’t the first time I’ve done an inspirational quote wall art. The first time was for our living room gallery wall. You can check out how I did that wooden sign here. 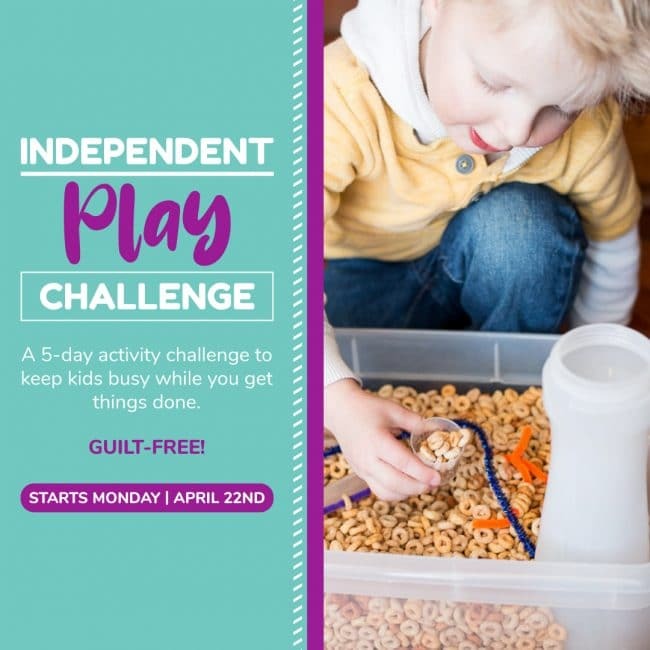 I headed over to Canva to type out my sign. I used 3 different fonts and arranged the page so I could print the whole thing on as little paper as possible. 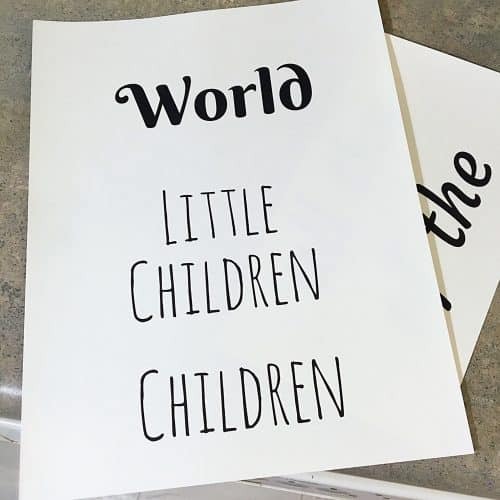 I printed the words out and cut each word out. This way I could control the spacing of the quote. I purchased a wooden sign from a craft store. 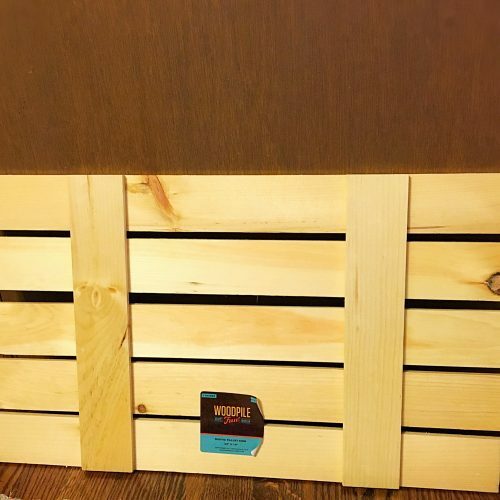 The pieces were spaced out farther than I wanted, but it was cheaper than buying the wood pieces separately. I also liked how soft the wood was. It made it easy to trace the words into it. I took the sign apart, gave it a quick coat of white paint and then reassembled it the way I wanted it. Then I got to work painting the sign. I took into consideration the things I learned the first time and also picked up one new great tip. 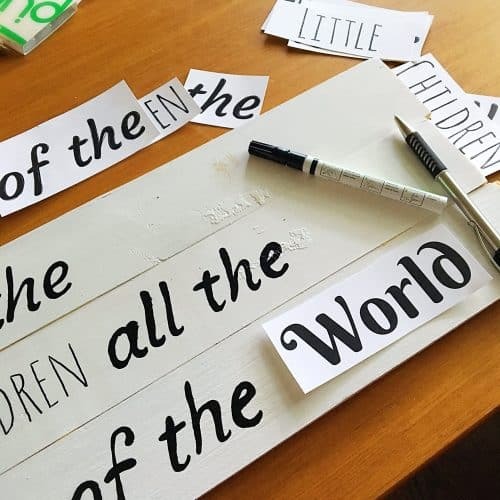 Use a paint marker to create inspirational quote wall art. This thing saved me so much time! 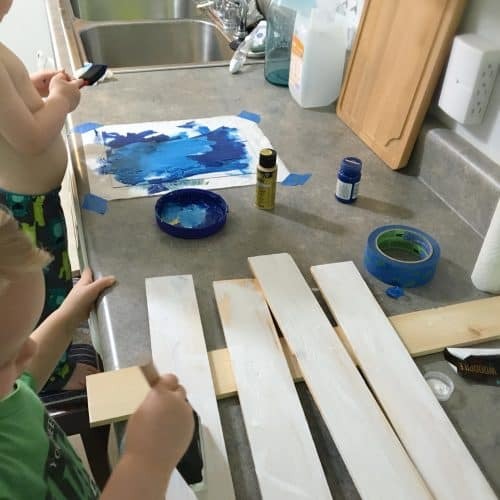 When I paint, I’m in crafty mode…not artist mode. 9 times out of 10, I squirt the paint directly onto what I’m painting and spread it out. That’s not how you paint a wall sign. And it’s the hardest part of this project. Using the paint pen gave me a ton of control and I felt less nervous about the project looking right. I used a thin tipped paint pen for this project. Next time I will use both a thick and a thin tip. That way I can better fill in some of the thicker letters. When I finished the project I had a lovely addition to the kids’ new bedroom. 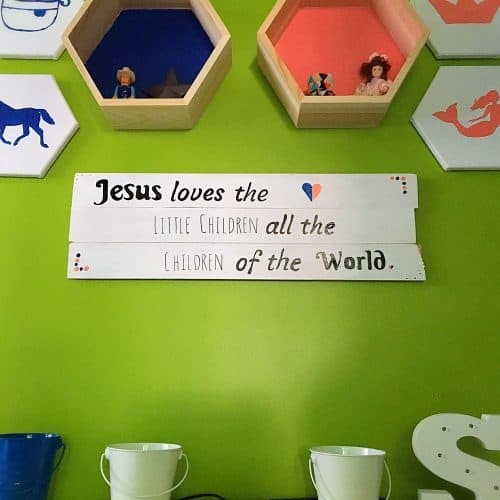 Check out the rest of the kids’ new room here! 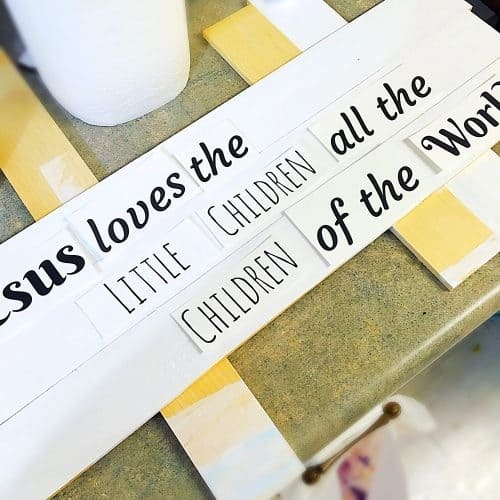 You could even use this technique for a one of a kind design too!